Potato and pepper recipe with garlic, black olives and parsley. An ideal accompaniment with steaks. Includes photograph, ingredients and cooking instructions. This potato and pepper recipe was given to us by Andrew Fairlie the head chef at Gleneagles, Scotland. It makes a delicious companion to rib eye steaks. 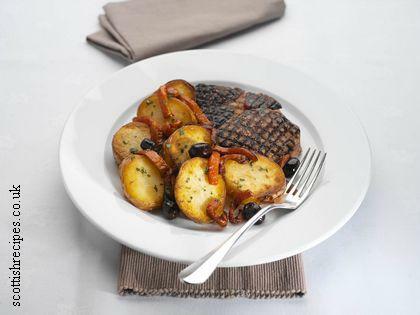 Rooster potatoes are recommended and on their website it is called grilled rib eye of beef with basquasie roosters. This will serve four. Wash the Roosters and then cook them whole and unpeeled in a large pan of boiling salted water until they are almost cooked. Drain the water and set aside the tatties to cool. Cut them into 1cm wide slices. Now brush the skin side of the red pepper with oil and place onto a tray. Cook under a hot grill until the skin blisters and blackens. Peel off the skin and cut the remainder into strips. Heat a large frying pan with vegetable oil and place the sliced Rooster potatoes evenly into the hot oil and fry until they become golden brown. Turn them over and fry the other side until they too become golden brown. Add the butter to the cooking potatoes. Wait until the butter has foamed and then add the peppers, garlic, olives and seasoning and toss together. Serve with grilled steak and garnish with chopped parsley.